On 10 September, Eastern Partnership Civil Society Forum (EaP CSF) and European Endowment for Democracy (EED) held a joint panel discussion – bringing representatives of Armenian civil society, European policy-makers and stakeholders together to discuss progress achieved so far in Armenia, at the EED office in Brussels. 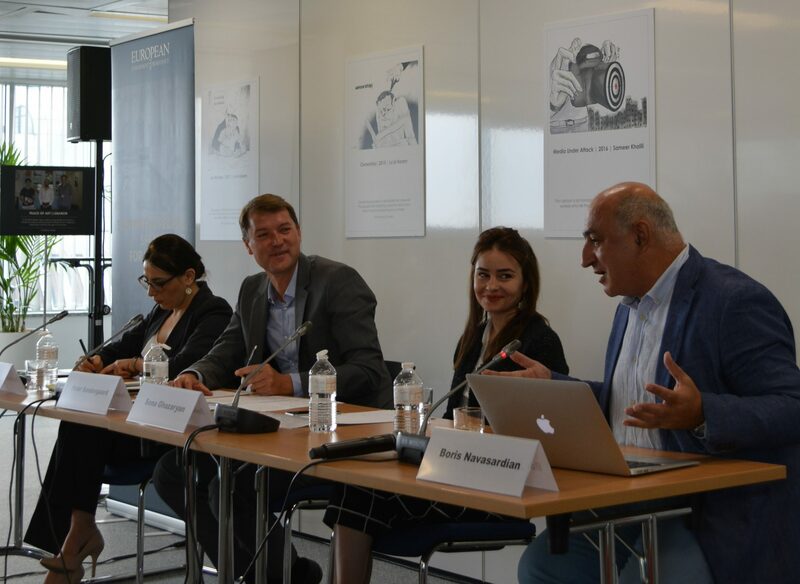 The discussions concerned judicial and electoral reforms, as well as media environment – the key sectors for ensuring sustainability and long-term aims of the Velvet Revolution. In the aftermath of Velvet Revolution, the newly-elected Armenian government faces challenges in fighting corruption, ensuring constitutional and institutional change, securing free and democratic elections (particularly, the upcoming vote on Yerevan City Council and Mayor), dealing with political prisoners, as well as numerous environmental problems. According to the representatives of Armenian civil society, the country needs to re-build its institutions, revise policy documents in line with the EU legislation, and draw the balance between executive and legislative branches of government – thus, creating fairer and more transparent conditions, based on the rule of law. This affects all citizens – but in the long-term, will ensure growth and a more stable future, particularly for small and medium enterprises (SMEs). Haykuhi Harutyunyan, President of the Protection of Rights Without Borders, stressed the need to develop mechanisms for solving the problem of human rights violations in Armenia, which would also include the situation during and immediately after the revolution. Harutyunyan pointed to the importance of accountability and processing existing documentation on all related cases, as well as thorough reconsideration of some government positions and its immunity. The Armenian Revolution, is not only a change in people, it is also a change in values – according to Sona Ghazaryan, activist from Reject Serzh, formerly No Pasaran Movement. The Electoral Code is changing – setting a great example for the whole country, showing how civil society can collaborate with the government, being directly involved in the political environment, but without losing any of its priorities or values. On the other hand, Boris Navasardian, President of the Yerevan Press Club, elaborated more on the (lacking) culture of democracy in Armenian society. People’s power is perceived differently in the regions than it is in Yerevan, highlighted Navasardian, and strong social media presence is not enough to instigate change. Even though the new government is putting more emphasis on social media to become closer to the people, Armenia needs to build new institutions – which would ensure that change works, with a noticeable improvement for those living further away from Yerevan. In this case, direct democracy is the only alternative to stagnation, and the only tool, with which one can ensure re-building of the institutions and achieving real change in the country. The current government enjoys strong support from society and very limited resistance from the former political elite. This is the window of opportunity to ease certain tensions between executive and legislative power, ensuring the implementation of reforms and further dialogue with Brussels. Armenia needs to re-build its relations with the EU – the country’s ambitions are more than the current CEPA agreement. Therefore, there is a need to revise and adapt existing policy to reflect the new situation in Armenia. In turn, the EU should not underestimate the power of its member states. European leaders should reach out to the Armenian government through bilateral meetings more. At the same time, if Armenia wants to continue fulfilling its obligations with Russia – maintaining its position as a trustworthy partner, it should send a clear signal that there are no additional expectations beyond the existing agreements. The panel closed with a discussion between the three speakers, and the floor, which included many EU stakeholders and Working Group 1 “Democracy, Human Rights, Good Governance and Stability” members, who were visiting Brussels ahead of their annual meeting the following day.